Here are 5 questions that will get you thinking critically about your current customer experience and the answers will inspire you to fiercely focus on continuous customer experience improvement. 1. What are our bottleneck steps and how to do we get rid of them? A bottleneck step is a step that slows down or impedes a part of the customer’s process. 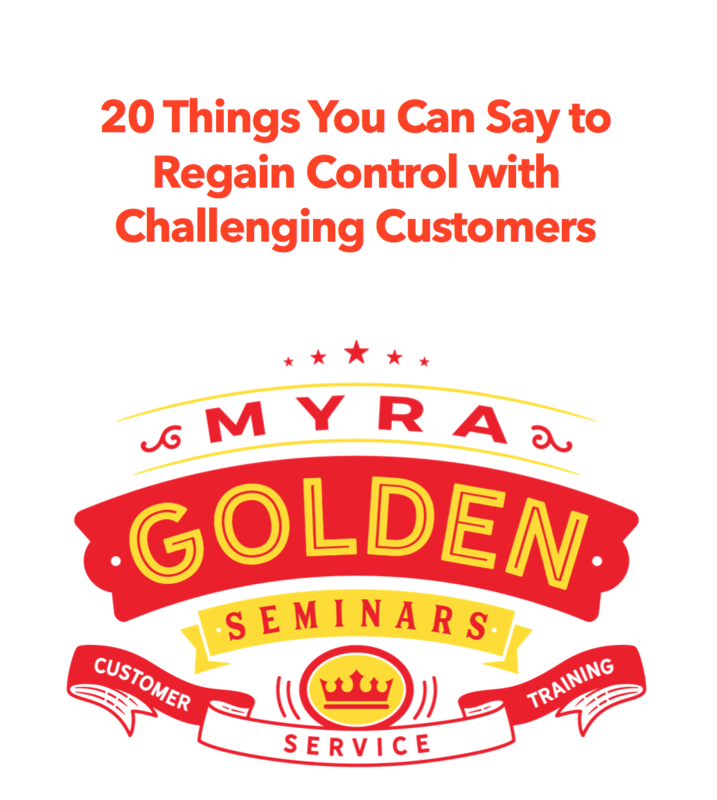 When I headed up Consumer Affairs at the corporate office for an international car rental company, a bottleneck for us was having to disconnect with a customer to call a franchisee to get the franchisee’s “side of the story” for simple problems. A simple problem could take literally days to resolve with this system. We removed the bottleneck by implementing a policy that said issues that could be resolved for $50 or less would be handled by the Representative and charged back to corporate and not to the franchisee. This allowed us to resolve more than 80% of issues on the first call. Bottlenecks cause delays and result in frustrated customers. Identify your bottlenecks and find ways to eliminate them. 2. Why aren’t we picking our low hanging fruit? Last year I wrote a blog post about my ridiculous experience at a tag agency. The agency had a 5-step process for simple vehicle tag renewals. The multi-step process caused long lines and frustrated, if not upset, customers. As I stood in the tag agency for more than 45 minutes, I literally created a service map of how I’d improve their processes for a better customer experience. (See it here.) Interestingly, all the agency needed to do was pick some low hanging fruit. 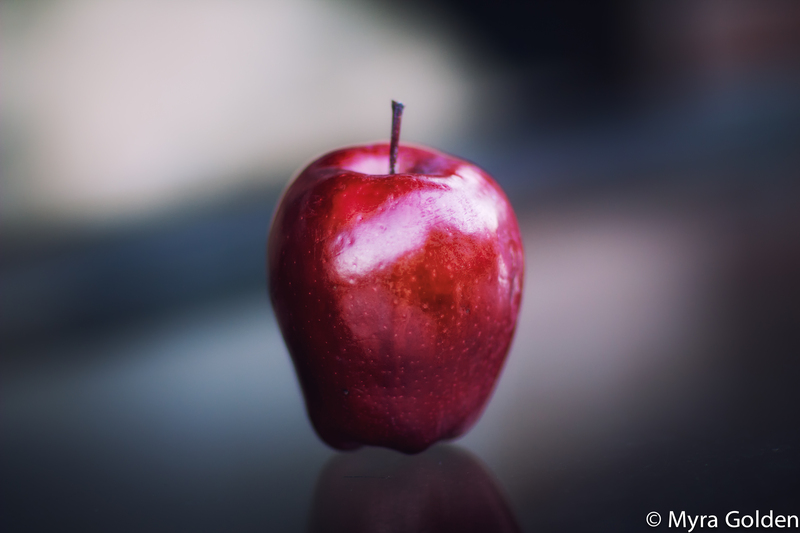 Low hanging fruit is simply something that can be obtained with very little effort. The tag agency could easily and smartly combine their 5-step process into one step to decrease wait time by at least 60%. Low hanging fruit simply requires that we stand back and observe our customer experience from the customer’s perspective. Then, we immediately go out and pick that low hanging fruit for a much sweeter customer experience. 3. How can we make the service experience easier, smoother, faster, or better? I’m working right now with a client who is trying to create the best possible customer experience for her clients. 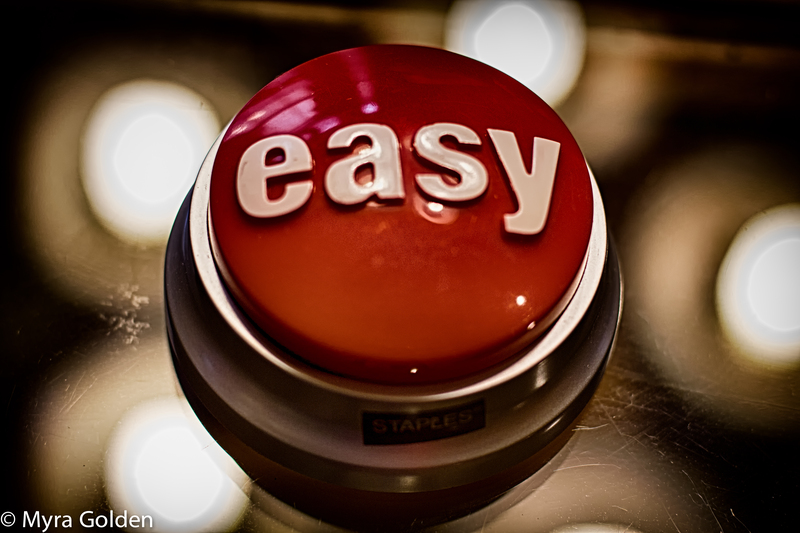 During a conference call with my client one morning, I thought about the “That Was Easy” campaign from Staples. I told my client that we need to step back and ask ourselves, what do we need to do differently, better, faster, smoother or more refreshingly, so that your customers hang up thinking, “that was easy!” What do you need to do differently, better, faster, smoother or more refreshingly, so that your customers hang up thinking, “that was easy!”? 4. How might we use QR codes to improve the customer experience? During a business trip, I saw this sign in a restroom in the Phoenix Airport. 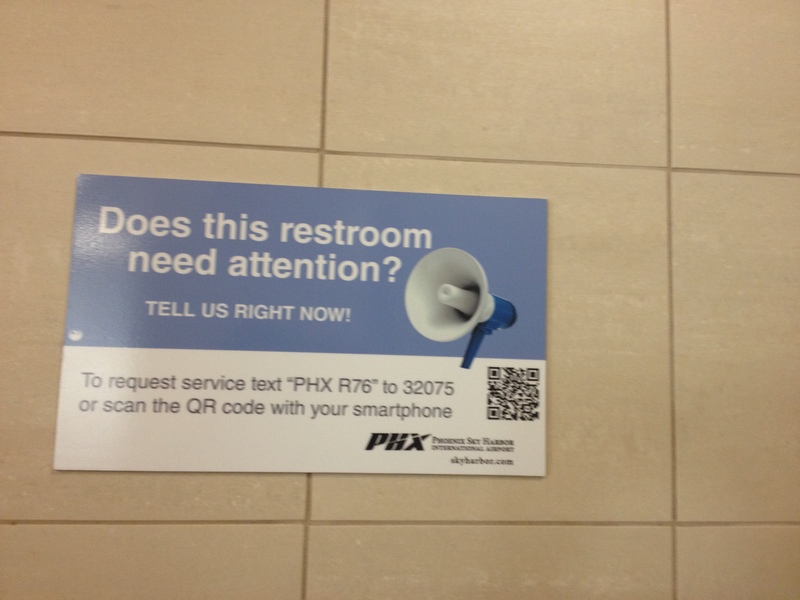 The Phoenix airport is using QR Codes to get customers to let them know if restrooms are in need of service. It’s not uncommon to see a sign in a public restroom that asks customers to let a member of the staff know if restrooms need attention, but how many customers really do that? Not many. The Phoenix airport makes it easy for customers to give feedback. All a customer would have to do is hold up their phone and scan the QR Code to let the staff know attention is needed. How might you use QR Codes to make your customer experience easier for customers? Could a QR Code be used to pull up FAQ? Perhaps to let an employee know a customer needs assistance on aisle 33? QR Codes aren’t just for ads or promotions. Think out of the box to find ways you might use QR Codes to surprise and delight your customers. 5. What can we learn about the customer experience from other companies? A few months ago I took a team from one of my client’s branches on a field trip to the Apple store and Barnes and Noble. Before the fieldtrip, I gave the team a list of questions and observation points so that we’d make the most productive use of our time. 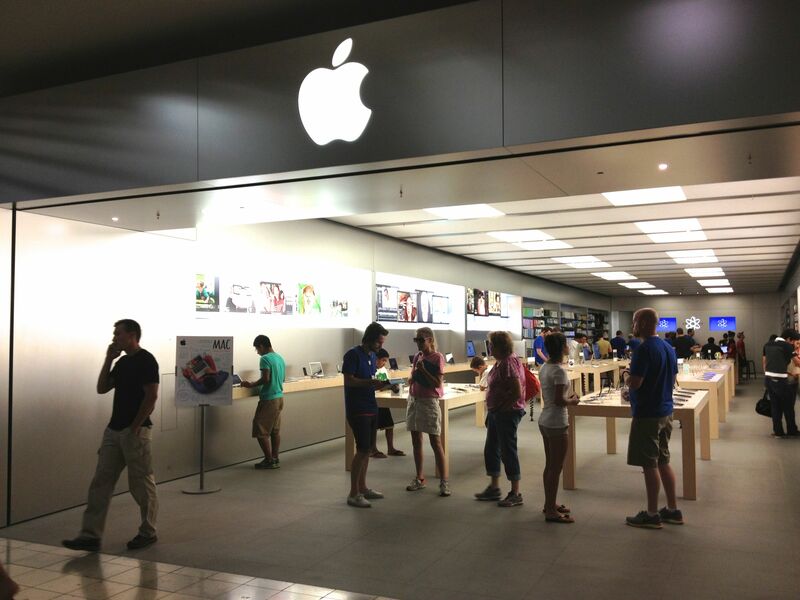 At the Apple store, my team observed greeting upon store entrance, analyzed employee interactions and even got to see an Apple employee eloquently handle a not so happy customer. After the fieldtrip, we met in a circle in the mall and discussed our observations and explored ways they can take back some great ideas and adopt and apply them in their organization. We left Apple and headed across the street to Barnes and Noble for part 2 of our field trip. My team really walked away with a lot of customer service insights from both Apple and Barnes and Noble. Consider taking a field trip to an organization that is known for delivering an amazing customer experience. The company doesn’t need to be in your industry. I’ve taken clients on field trips to Starbucks, local shops famous for service, and to restaurants. The bottom line: Sit down with your team and ask these 5 questions. Taking action on even one of these questions can have a dramatic impact on your customer experience. 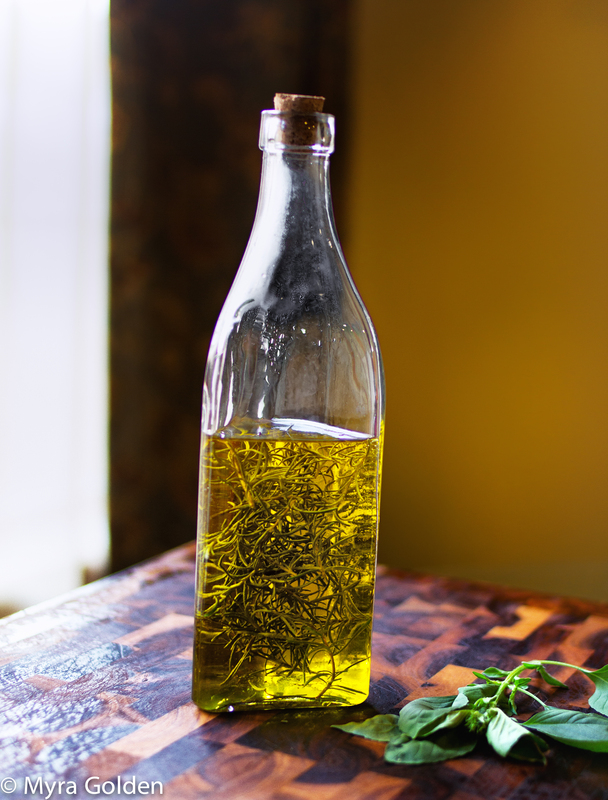 If you’re interested, here’s where I got the recipe for my Rosemary infused olive oil. Great post, Myra. You gave me a framework for my next step. I’m so glad this helped you Marie!